The Land and Water Conservation Fund (LWCF) is not only used to protect our parks and trails, sportsmen’s access, and wildlife habitat, it is also the best tool we have for preserving our nation’s treasured historical places. Among those historic sites are battlefields from the Revolutionary War and Civil War that not only defined our country’s independence and momentum towards freedom, but are also sites of unimaginable bravery and individual sacrifice, often the final resting place of countless patriotic soldiers. Two sources of federal funding from LWCF are available for the protection of these sites: National Park Service (NPS) acquisitions within federal units (usually National Battlefields, National Military Parks or National Historical Parks), and grants to states and localities for acquisition of priority battlefields through the American Battlefield Protection Program (ABPP). These two different LWCF tools often work together to protect an entire battlefield landscape across different political boundaries. Below are some of the iconic battlefields that have been protected by LWCF, America’s most important conservation and recreation program. To protect our battlefields and historic sites, Congress needs to #SaveLWCF from expiration in September 2018, preventing future places of historical significance from being lost forever. Follow these links for more information on LWCF and how to contact your representative and encourage them to #SaveLWCF. The Union victory at the Battle of Gettysburg over the first three days of July 1863 was one of the Civil War’s great turning points as it pushed back General Robert E. Lee’s invasion of the North. Nonetheless, nearly two more years of bloody conflict remained. A few months following the battle in November, as the town was still burdened with wounded and the dead and the leaves were down from the trees at the newly dedicated cemetery, President Abraham Lincoln gave his famous Gettysburg Address, eulogizing the fallen soldiers and urging from the war “a new birth of freedom.” Gettysburg National Military Park has received over $19 million in LWCF funding to the NPS and $3.2 million in ABPP funding to preserve the park and create a comprehensive learning experience for the more than a million annual visitors that come to Gettysburg. With over 23,000 dead, wounded or missing, the Battle of Antietam is considered the bloodiest day in American history. For over 12 hours on September 17, 1862, the Union army attacked from its right to left across a cornfield, along a farm path soon to be called Bloody Lane, and a three-arched stone bridge, but never succeeded in dislodging the Confederates, who left on their own accord two days later. Following Lee’s retreat, President Lincoln issued a preliminary Emancipation Proclamation, incorporating the end of slavery into the cause of Union victory. Over $7.5 million in federal NPS funding and $1.6 million in ABPP funding has protected this significant part of U.S. history and ensured that the hallowed grounds are preserved for future generations. Fredericksburg and Spotsylvania National Military Park preserves four Civil War battlefields situated between Washington, DC and Richmond, VA. 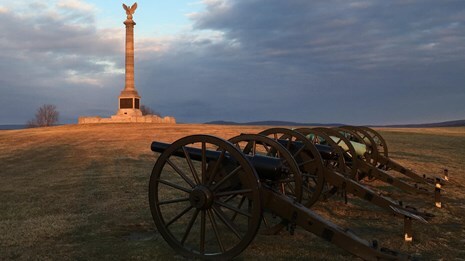 The park has received nearly $36 million from LWCF, protecting and enhancing interpretation at Fredericksburg, Chancellorsville, Wilderness, and Spotsylvania Court House battlefields. In the late 1990's, the NPS owned less than 1,700 acres at Chancellorsville, a battleground where General Robert E. Lee achieved one of his greatest victories but also lost his top deputy commander, General Thomas J. “Stonewall” Jackson. Due to intense development pressures, the National Trust for Historic Preservation listed Chancellorsville Battlefield among America’s 11 Most Endangered Historic Places in 1998. In the twenty years since, the NPS, national partners like the Civil War Trust (now known as American Battlefield Trust), and local partners like the Central Virginia Battlefields Trust have used LWCF to purchase and protect hundreds of additional acres in and around Chancellorsville, including the location of Jackson’s famous flank attack. Commemorating the opening battle in the American Revolutionary War, Minute Man National Historical Park has received $12 million in LWCF funding. The acquisition of Barrett’s Farm by the NPS in 2012 with LWCF funding completed a multiyear preservation effort, including the passage of legislation in Congress in 2009 to expand the park’s boundaries to include this important historical site, which was threatened by residential development pressure. British intelligence suspected the farm to be a weapons cache and was one of the targets of the British expedition that left Boston on April 19, 1776. The troops met resistance at Lexington and Concord, one of the sparks of the American Revolution. On average, a million people visit Minute Man National Historical Park each year, accounting for approximately $52 million per year in spending and supporting about 700 jobs in the local area. Securing the length of the Mississippi River from the confluence of the Ohio River in Cairo, Illinois to the delta south of New Orleans in Louisiana was an early strategic goal of the Union armies and navies. Located on a set of bluffs, Vicksburg was the most prominent Confederate fortification along the river. After a number of various failures in 1862 and early 1863, General Ulysses S. Grant launched a successful campaign that resulted in a 47-day siege of Vicksburg. Created in 1899, Vicksburg National Military Park has a deep tradition of preservation – there are over 1,300 monuments, tablets, and markers erected by veterans, states, and organizations at the battlefield along the fortifications and park roads. Over $350,000 of ABPP funds and $1.6 million of NPS dollars have been used to protect additional historical lands at Vicksburg.